For Kunstmann and his associates, there is little appeal to wandering around underground. Their cinema aside, the catacombs are a means, not an end: a way to access UX work-sites or to hide their tracks. But as a first-time visitor plunging into these gray chambers, the experience is thrilling. It is a labyrinth of branching channels and sudden openings, cool and quiet. Most of the catacombs are dry, tall enough to stand in – but from time to time we duck or crawl, or swish into ankle-high water. Still, they are not the dank, sweaty caves I imagined. Even wading into a passage called Banga, whose thigh-high water swirls like miso soup, the tunnel's soft silence recalls a theater, a wine-cellar, an attic. In Kunstmann's book, cataphiles like Crato are called "bodzaux," for their wet and dirty boots, or "Ravioli", for their tendency to dine on boxed dumplings. ("I prefer wine and sausage," my guide retorts.) Ravioli seek to "consecrate" the underground, Kunstmann argues, guarding it from precisely the kind of transformations that UX enjoy. "[They] are protecting an image [of the catacombs] and they want to keep this image intact for the feelings it evokes in them." Crato speaks of these feelings without actually speaking of them. He talks about how years ago, he and his now-wife would spend all of Saturday night in the tunnels, wandering until four in the morning. They would emerge, dust themselves off, go to sleep – and on Sunday they would walk the same route, retrace the same steps, aboveground, hand in hand. While this is a beautiful image, it's the opposite of what UX hope to accomplish. "It's a typically Parisian phenomenon," Kunstmann sighs. "Nostalgia for a period we didn't know. Areas 'flashed' in time. The work of UX is to de-flash, to thaw, to transform." As Crato and I weave beneath the 14th arrondissement, the subway murmurs in a passage over our heads. You could walk these caves in jeans and sneakers, I think. I have read how the Painted Lizard ordered people to do the circuit naked, for his own wicked entertainment. I am in knee-high boots and a cardigan. Crato wears the basic cataphile uniform: hip waders; waterproof backpack; strong flashlight; gloves; a cap to keep off the dust. The athletics stores of Paris, he says with a grin, sell a disproportionate number of fishermen's boots and impermeable packs. Although the catacombs are covered in graffiti tags, there are also sudden instances of art – amateur gargoyles, carved castles, life-size sculptures of cataphiles. Crato brings me to La Plage, "the beach," a large gallery with a sand-packed floor. Our flashlights sweep across wide murals: Hokusai waves and Max Ernst-like portraits. In the Hall of Anubis we sit at a table chiselled out of stone. We light candles, drink beer, share cookies and chocolate. I am absolutely enchanted. I have no idea of the time. For the most part, cataphiles don't dispute Kunstmann's characterization of them. BHV says his friends enjoy "taking photos, exploring a particular area, repairing things, going to spots where no one has visited for a long time." 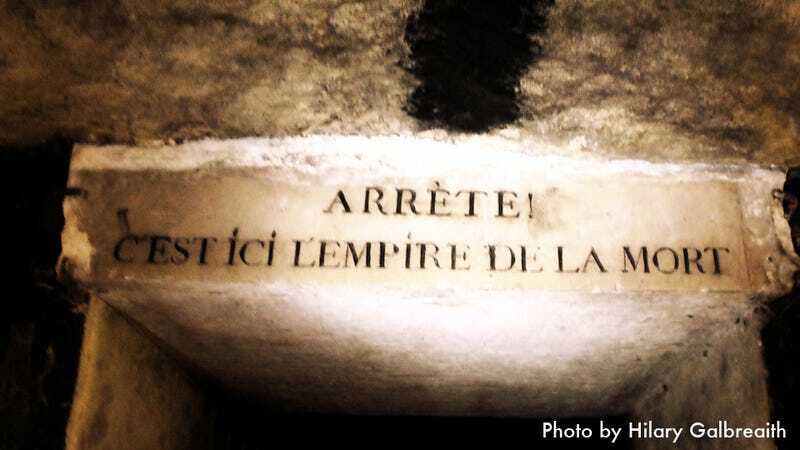 The community's holy grail, he suggests, is to clandestinely enter the Catacomb Museum. I balk at this – The same place you can visit for just eight euro, six days a week? "Yes," he agrees, "but that's the goal of tons of cataphiles. And they succeed almost every year – every year there's a hole that's drilled." When cataphiles do stage large events, they tend to be one-off parties – not permanent "transformational" cinema installations. Crato remembers someone bringing down oysters – stupid, silly, "just as heavy on the way back as on the way down." BHV has organized two Breton-themed shindigs, where more than 300 people joined dancers, musicians and amateur chefs cooking subterranean crêpes. Among the largest celebrations was a farewell to Commandant Jean-Claude Saratte in 2000. Head of the catacomb police for 21 years, Saratte was respected for his knowledge, instincts and moderation – pursuing the drug-user, vandal or "tibia collector" instead of the gentle catacomb geek. Today, officers of BICS (la Brigade d'Intervention de la Compagnie Sportive) patrol the catacomb thoroughfares handing out €65 tickets. The cata-cops are regarded with resentment and disdain. But they force cataphiles to be vigilant: listening, looking out for standard-issue lights, sniffing for aftershave. It is illegal to drink on public streets, Crato proposes, but not beneath them. "When you're caught, you have the chance to recognize or not recognize an infraction," he explains to me. "If you choose the latter, you're supposed to get an appointment with a judge." Crato has been awaiting his court date for years – and counting down the days until the automatic amnesty triggered by each presidential election. We emerge from the maze three hours later, flashlights still shining, and again we are wreathed in smoke. It is dark as night. The opening of the railway tunnel is a circle of goldwhite light in the far distance. Treading toward the open air, out and past the wild bright green of the weeds, it's as if we're passing through stained glass. On our way back along the tracks we meet a quartet of cataphiles in black hoodies and running shoes, acquaintances of Crato's. We talk. The conversation is a mixture of bravado, feigned indifference, outbursts of earnest feeling. They talk of girls, parties, police, numbskulls with smoke bombs. These men seem so gentle. Watching them smile, UX's rejection of this community seems unkind. No, Ravioli are not engaged in the same activities; no, their ambitions are not to the same scale. But if UX want to be something other than a secret club, at least they could be friendly with their neighbors. Kunstmann sees it differently. UX are absolutely unrelated to these cataphiles, separate "from the start." "We were learning from one experience to another," he says. "We had an intention for these places." Besides, his group is not based in the catacombs. As Paris was to learn, they hide in the aboveground as well.